Saint Francis Of Assisi - Patron Saint Of Animals and the Enviroment - Stainless Steel Pendant. Front of Pendant is Engraved with St. Francis of Assisi Image and Pray for Us. We Will Personalize The Back By Engraving Your Name, Date, Special Message To Create A Meaningful Gift And Special Sentiment. We Will Engrave the Back of Pendant with 4x Lines With A Total Of 15 Characters Max Per Line. Includes An 18" Or 20" Cable Chain. Hypoallergenic Pendant and Chain are Packaged in Jewelry Pouch and Gift Box. Dog Tag Style Pendant with Bail Measures 1.57" x .86". This Medal Is Perfect for Birthdays, Anniversaries, Commemorating a Special Date, Person or Pet. Show Your Devotion to Saint Jude Thaddeus, the Patron Saint of Hope and Impossible Causes and One of the Original 12 Apostles. The Front Of The Stainless Steel Oval Tag Pendant Is Engraved with St. Jude Thaddeus. The Back Is Engraved With His Nine Day Novena Prayer. Includes An 18" Or 20" Cable Chain and Measures 1 3/8" x 1". Hypoallergenic Pendant and Chain are Packaged in Jewelry Pouch and Gift Box. Makes a Wonderful Gift of Prayers of Gratitude, Petitions for Strength and Help and His Offerings of Hope. Prayer on Back of Pendant Reads " May the Sacred Heart of Jesus be adored, glorified and preserved now and forever. Sacred Heart of Jesus, have mercy on us. Saint Jude, helper and keeper of the hopeless, pray for us. Thank You St. Jude. Amen." Hypoallergenic and Tarnish Free Stainless Steel Oval Pendant Engraved With Saint Michael The Archangel on The Front And His Prayer Engraved On The Back of Pendant. Pendant Measures 1 3/8" x 1" and Includes Your Choice of 18" or 20" Cable Chain. This Pendant is said to bring its wearers Safe Travels and Protection from Evil. Especially loved by Soldiers, Police And Doctors, It Can Be Worn Everyday by Anyone Needing Protection from the Risks of Daily Life. Packaged in Blue Jewelry Pouch and Gift Box. Engraved Stainless Steel St. Christopher Pendant Is A Meaningful Way To Keep Your Beliefs And Protection During Your Journeys Close To Your Heart. Front of Pendant is Engraved with Image of Saint Christopher and Pray for Us. Saint Christopher is The Patron Saint of Travellers. We Will Personalize The Back of Pendant By Engraving Your Names, Dates, Special Message Or Blessing. We will Engrave 4x Lines With Total Of 15 Characters Max Per Line. Includes An 18" Or 20" Cable Chain. Hypoallergenic and Tarnish Free Pendant and Chain Are Packaged in Jewelry Pouch with Gift Box. Dog Tag Style Pendant with Bail Measures 1.57" x .86". 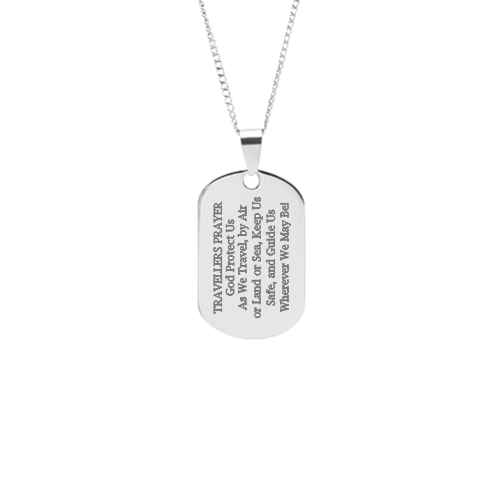 Personalized Football Oval Dog Tag Pendant Crafted In Hypoallergenic and Tarnish Free Stainless Steel The Pendant Is A Perfect Coach, Player, Parent And Football Team Gift. We will Engrave The Front With 2x Lines Available To Personalize (10x Characters Max Each Line) And 4x Lines On The Back (12x Characters Max Each Line). Includes An 18" Or 20" Cable Chain. Pendant is Packaged in Jewelry Pouch with Gift Box. Interested In Team, Group Or Quantity Orders - Please Contact Us At support@dmdcollection.com. 1.21 ctw, Oval 8x6mm Cubic Zirconia (CZ) Solitaire Pendant Set In Platinum Plated Sterling Silver (925 SS). On The Side Of The Setting Is An Unexpected Surprise, 2 Lovely Heart Cut Outs. Includes An 18" Sterling Silver Rope Chain with Lobster Clasp. Pendant Arrives in Jewelry Pouch and Gift Box. The Look of Diamonds for Less ! Personalized Engraved Sporty Oval Dog Tag Soccer Jersey Pendant Is Ideal For All Soccer Players And Fans. The Pendant is Engraved with Soccer Jersey On The Front. We will Customize The Front And Back With Engraving. We will Engrave 2x Lines On The Front (10x Characters Max Each Line) and 4x Lines On The Back (12x Characters Max Each Line). Includes An 18" Or 20" Cable Chain. Hypoallergenic and Tarnish Free Pendant and Chain are Packaged in Jewelry Pouch and Gift Box. Great for Soccer Awards and Team Gifts ! Interested In Team, Group Or Quantity Orders - Please Contact Us At support@dmdcollection.com. Show Your Daughter How Much You Value Her Love and Friendship With Our Stainless Steel Heart Pendant. Includes An 18" Stainless Steel Bead Chain. Pendant is packaged in blue jewelers pouch and gift box. Pendant Measures 1" and Front of Pendant is Engraved with "Always My Daughter Always My Friend". Pendant finish is brushed and includes a heart cutout as a reflection of your love. We Will Engrave the back of the pendant with your message to create a personalized gift she will treasure. We can Engrave Up to 2 Lines - 10 Characters Maximum Per Line. Both Pendant and Chain are Hypoallergenic Stainless Steel. This Stainless Steel pendant and chain will not tarnish and are durable and easy to care for. How Sweet It Is To Receive and Wear Personalized Holiday Jewelry ! Crafted In Stainless Steel This Pendant Features An Engraved Gingerbread Man and Happy Holidays on the Front. We Will Personalized The Back Of The Pendant By Engraving Your Special Message (4x Lines With Total Of 12 Characters Max per Line). Includes An 18" Or 20" Cable Chain with Lobster Clasp. Hypoallergenic Pendant and Chain are Packaged In Jewelry Pouch and Gift Box. Pendant with Bail Measures 1.57" x .86". Perfect for Your Favorite Baker, Award and Recognition Gifts, Hostess Gifts, Thank Yous, Teachers and Kids. Create Your Own Personalized Keepsake to be Treasured for Years to Come.